After my first visit to Providence with H.C. of L.A. and O.C. 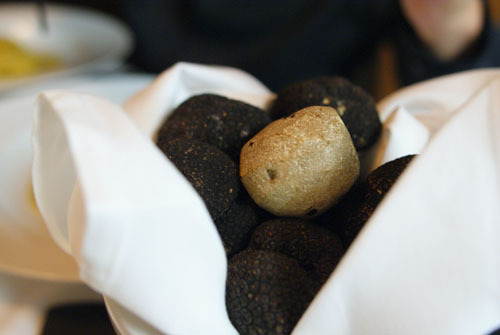 Foodventures, where I had the nine-course tasting, I vowed to return and tackle the 16-course Chef's Menu. Well, I came back a second time for a 5x5 event, ordered a la carte on meal three, and then paid a fourth visit for another 5x5. I was thus determined that there would no more messing around this time: my fifth trip would be for the Chef's Menu, end of story. 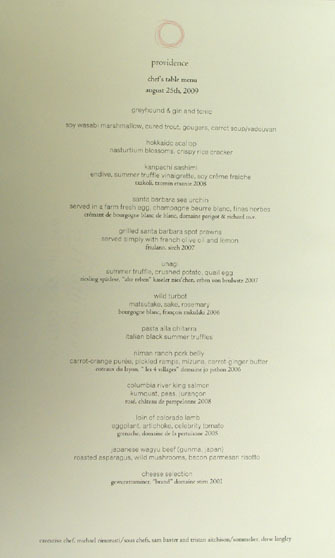 And actually, I did it one better: Dason, one of my readers, arranged a special 22-course degustation, which would end up being the longest meal I've ever had (edging out my fourth Urasawa dinner), clocking in at an astounding 6.5 hours! Above we see the list of courses that we had; click for larger versions. The bill was almost indecipherable, but after a series of specials and discounts, the tab came out to about $360 per person, inclusive of tax, tea, tonic, tip, and tipple. 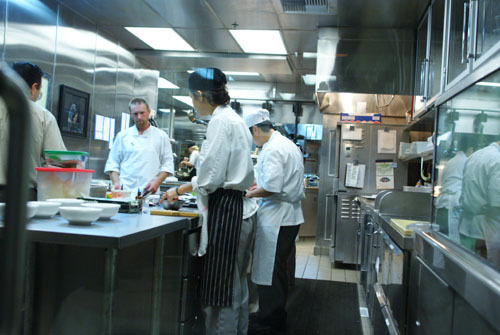 We were seated at the Chef's Table, which provided us a superb view of the dynamic, yet strangely tranquil kitchen. One of my dining companions spotted a young man (right photo) whom she swore worked at Urasawa previously. I was feeling a bit incredulous of that claim, so we made a bet--the loser would treat the winner to the $95 omakase at Wakasan. Of course, I lost. It turns out that the lad, James, was indeed our server at Urasawa. He'd left the restaurant in December of last year to work at Kuru-Kuru Sushi in Burbank (where he'd been prior to his stint at the "U"). 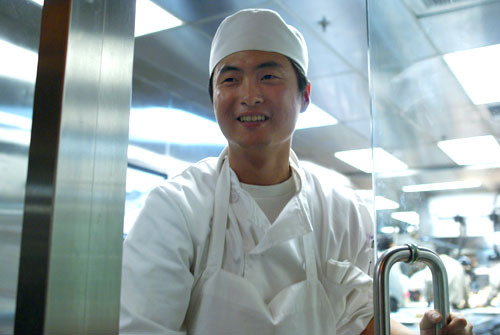 James came to Providence in order to gain more exposure to Western cooking techniques, and is currently working as the garde manger. Interestingly, we were also told that when Urasawa-san himself dines at Providence, he always sits at the Chef's Table. 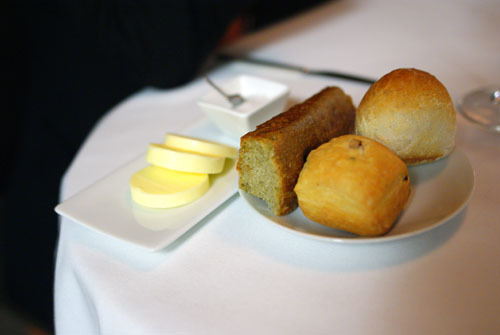 A troika of bread was presented: nori focaccia (my favorite), bacon brioche, and plain white. As usual, salt and butter were also provided. 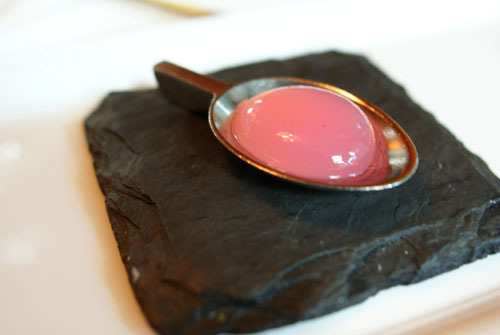 An amuse bouche at Providence almost always includes some sort of spherification. This time is was a Greyhound cocktail, which I'd also had at the last 5x5. 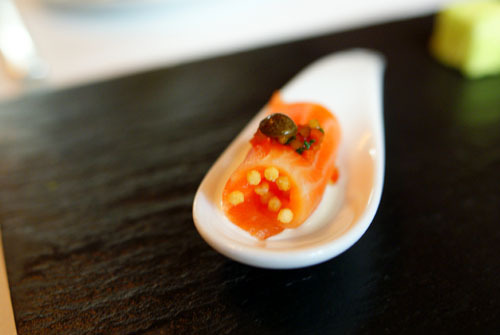 A Greyhound is a vodka- or gin-based cocktail enhanced with grapefruit, and this time around, the spherification was somewhat richer in flavor than before, with the tart quintessence of grapefruit artfully captured and exploding in my mouth upon mastication. 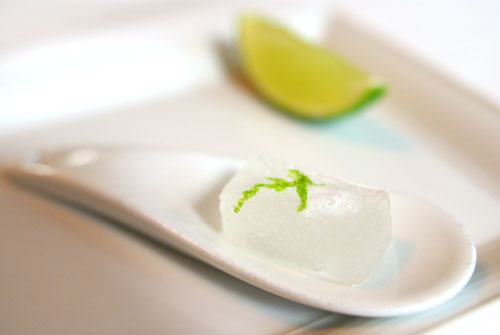 Along with the Greyhound came a "Gin and Tonic" in gelée form. We were told to squeeze lime juice onto the translucent, oblong cuboid, which in turn activated a distinct, tingly effervescence, simulating the carbonation of tonic water. It was a tart, fizzy experience, like a G&T with very little alcohol. We were told to eat from left to right, so I first tried the cured Tasmanian trout with ginger crème fraîche, crispy rice, and shimeji mushrooms. I quite liked this one, with the mushrooms adding a certain weight to the delicate nature of the fish, while the rice lingered on the close, while also providing a fantastic crunchy textural element to liven things up. Second was the gougère, made with Gruyère and Parmesan. When I bit into it, the cheese puff exploded, coating my palate with its contents--a hot, gooey, salty liquid that was quite in-your-face, thanks to the use of that second cheese. Next I had the soy marshmallow, coated with wasabi-green pea dust. The marshmallow itself was incredibly soft, almost ethereal, but packed a biting punch, an amalgam of salty and sweet and spicy, with a lingering pea-tinged finish. 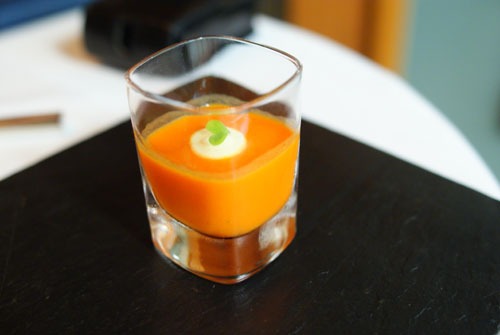 Finally came the chilled carrot soup with vadouvan and crème fraîche. The spice blend was apparent on the fiery attack, but was tempered somewhat by the creamy crème fraîche; the carrot only came to the fore on the late midpalate, and was the main component I tasted on the finish. 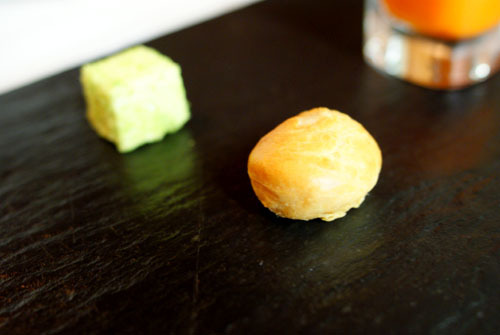 The final amuse was also the best. 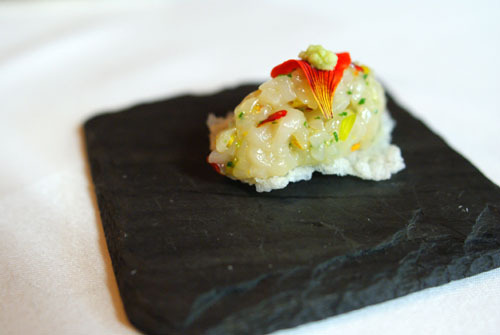 The key here was how the nasturtium and wasabi countered the scallop's innate sweetness with an admixture of peppery and spicy notes, thus forming the perfect foil to the mollusk. Meanwhile, the rice added a fantastic crispness to an otherwise creamy dish, taking things up a notch. Superb. Our first "real" course was comprised of kanpachi, served with sous vide endive, yuzu, soba, soy crème fraîche, and black truffle. 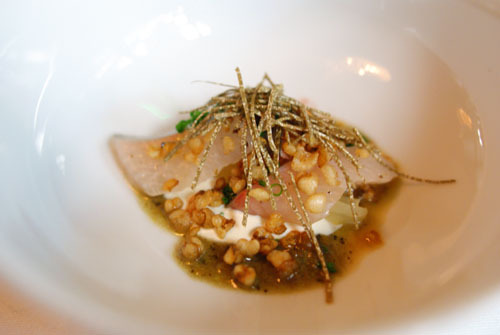 What made this dish for me was the interplay between the kanpachi and the truffle, with the truffle adding a profound earthiness and gravity to the otherwise subtle fish. Texturally, things worked out perfectly as well, with the bits of soba adding a fantastic crunch to things, while the endive had a very pleasing, snappy consistency as well. Arguably my favorite course of the evening. crémant de bourgogne blanc de blanc, domaine parigot & richard m.v. 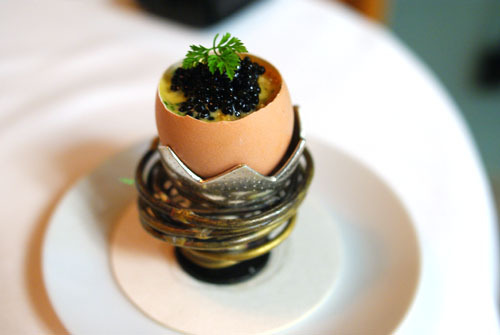 Next we have Cimarusti's take on the classic "egg cup" dish: slow-cooked yolk, Santa Barbara sea urchin, Champagne butter sauce, toasted brioche croutons, fines herbes, and American caviar. I appreciated how the salty caviar cut the rich, monolithic creaminess of the yolk, but the egg-on-egg action was the ticket here, with the yolk tempering the brininess of the uni considerably. Some, however, would've liked the uni to have been more apparent, and I can definitely understand that point of view as well. 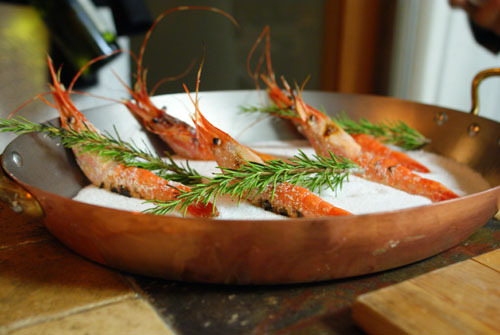 Now for some tableside presentation: a cart was wheeled in, on top of which sat a pan containing five beautiful salt-grilled spot prawns. 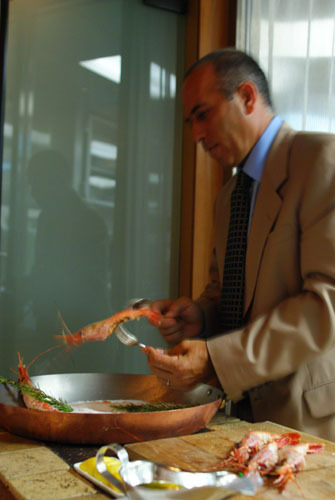 Providence Co-Owner and Maître d' Donato Poto proceeded to serve the shrimp, separating the head and tail sections, then splitting the two pieces before plating. 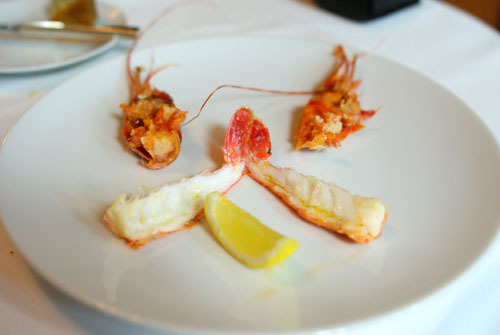 The natural sweetness of prawn was deftly balanced by the salt, while the lemon added a great sour tang to spice things up. Most of my dining companions actually preferred the more flavorful head portion. Here was quite possibly the best preparation of unagi (freshwater eel) I've ever had. Though some thought that it was overly fishy, I appreciated the eel's strong, heady savor, as well as its exceptionally crisp, oily skin. The cruces of the dish for me was the potato, which did a great job in mitigating the unagi's overt fishiness, as well as the quail egg, which added a moderating creaminess to the dish. 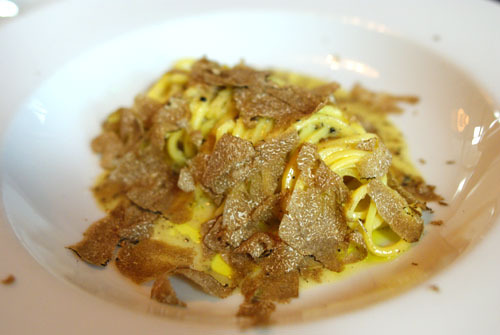 Again, as with the first course, the application of summer truffle worked beautifully here as well. Following up my best ever unagi was perhaps my best ever turbot. 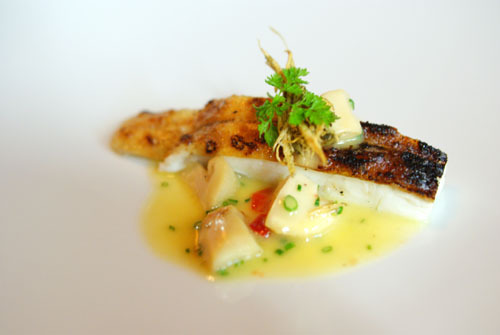 What did it for me was the use of rosemary; pairing it with the turbot was genius, with the pungency of the herb complementing the hearty, buttery fish superbly. I especially enjoyed the crispy, super-saporous skin. The matsutakes, at the same time, mixed things up texturally, while providing a subtle veil of earthiness. A specialty of the Abruzzo region, alla chitarra refers to pasta that has been formed by forcing flat pasta through a chitarra, a grid of finely spaced strings. The pasta was dressed simply with olive oil and set before us, unadorned. Donato then stepped inside with a basket of truffles, and proceed to give each of us a generous shaving. The fungi's heady aroma was intoxicating, but its flavor was actually tempered by the heavy, al dente noodles, as well as the olive oil. 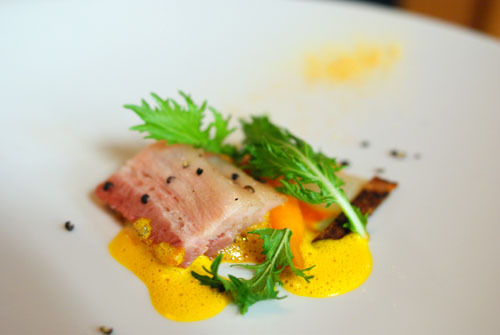 I've been liking pork belly more and more as of late, and this course just continued the trend. The pork itself actually reminded us of pastrami, with its distinctive brine and pepperiness. It was also quite fatty, but not overwhelming so, with a delightfully crunchy skin to boot. The belly's weight was simultaneously balanced by the sweetness from the carrot sauce and the pungent bitterness of the mizuna and ramps. The salmon was a point of contention for us. The salmon itself couldn't be faulted, but some thought that the kumquat was far too tart, overshadowing the natural savor of the fish. 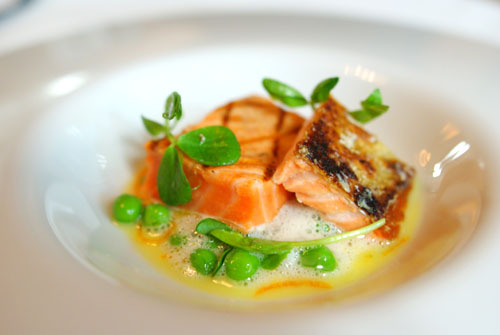 For me though, that wasn't an issue, and I really appreciated the vegetal tang and finish imparted by the peas. We all, however, agreed on the brilliance of the stupendously unctuous and flavorful skin. The lamb had the honor of inspiring the best quote of the night: My lamb has more game than my date! This seemingly Delicious Life-inspired line had some merit though; the lamb was more robust than most, and though it was too overbearing for some, I appreciated its rank, as well as its delicate body. But it wasn't just about the lamb, the tomato compote added a distinct weight, a marked sweetness to counter the slight sourness of the meat, while the artichoke accented things with a bit of bitterness. The best accoutrement, though, was the basil sauce, with a bold pungency that greatly tempered the lamb. I think we were all blown away by the beef here. Magnificently marbled, tremendously tender, supremely sapid, with a splendid, savory crust--it was as good as any you'd find in a high-end steakhouse, and that includes CUT. It was so good, in fact, that I preferred to eat it completely devoid of any trappings. 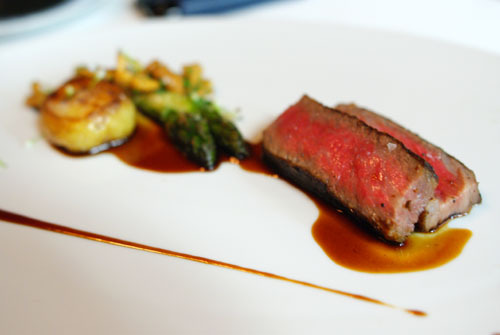 The asparagus, mushroom, butterball potato, beef jus, even the risotto--they were fine, but unnecessary in my opinion. Capriole Sofia - My second favorite of the bunch, this was a delicate, slightly sweet, lightly flavored goat cheese from producer Capriole out of Greenville, Indiana. 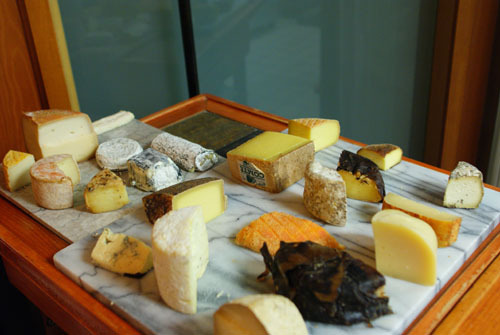 Tomme de Chèvre des Pyrenees - Tomme is a term that generally refers to cheese produced in the French alps; however, this example was from a different mountain range: the Pyrenees. It was a goat's milk cheese, with a mild, subtly salty character. 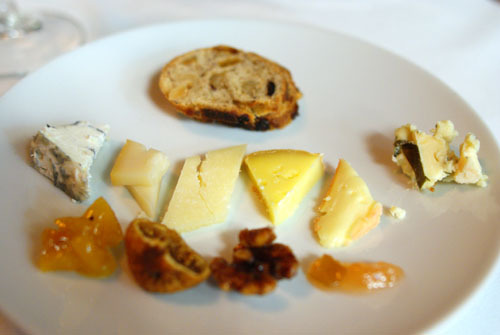 Ossau-Iraty - Next was another cheese from the Pyrenees, though this time one made from sheep milk. 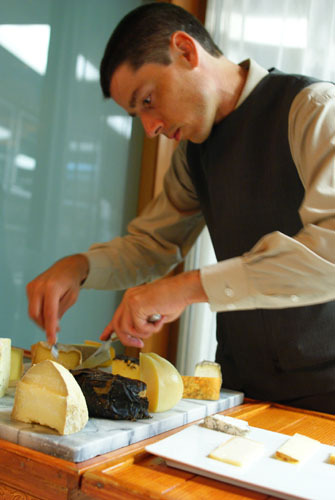 The Ossau-Iraty had a creamy, medium-firm body and lightly nutty sapor. Gubbeen Cheese - From Ireland comes this surface-ripened, semi-soft cow's milk cheese with a pleasant, soft earthiness and lovely nuttiness. Grès de Vosges - This was a soft cow's milk cheese from Alsace, notable for its gooey consistency and pungent, sweet flavor (from the use of kirsch in the production process). Easily my favorite of the set. Rogue River Blue Cheese - A cheese plate just wouldn't seem complete without a bleu, so here we had one from Rogue Creamery of Central Point, Oregon. Made from raw cow's milk and wrapped in grape leaves, the cheese was sharp, herbaceous, and a bit sweet. And with that, we were on to dessert. 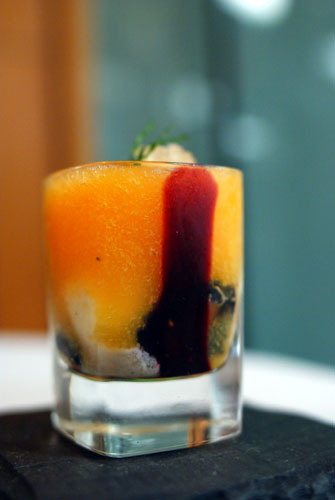 Though our menus listed the "Mojito" spherification as the pre-dessert, we were instead given this (due to the similarity between the Mojito and the Greyhound): a cantaloupe soup with blackberry gelée, vanilla ice cream, lime granita, and mint. It was a great substitution. The cantaloupe was ever-present, a base on which the sweet berry, sour lime, and creamy vanilla could play, while the mint gave the shot an overarching lightness. First up was a dessert with a distinctly Thai-influenced tinge, thanks to the coconut and the pandan-esque flavor of the sorbet. 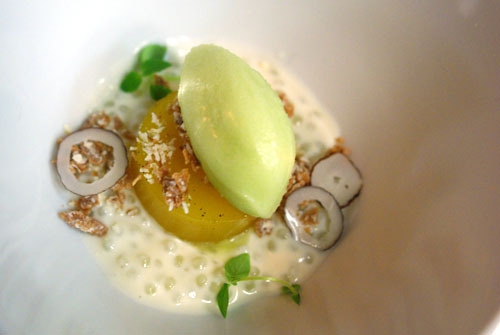 It thus had a sweetness reminiscent of Lod-Chong Nam Ka-Ti, a dessert of pandan noodles in coconut milk, but was balanced by the tartness of the kalamansi, or calamondin, gelée. Overall, a light, refreshing course to kick things off. Next, an interesting study in the interaction between sweet and sour. We have a meringue tube, filled with a tangy yuzu curd, atop an almond cake. 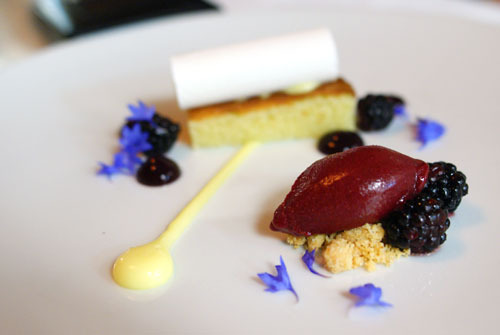 The curd-cake complex was rather nondescript on its own, but was countered beautifully by the sorbet, imbued with the saccharine essence of blackberry, and the blackberry fruit itself. Surprisingly, the bracing, pungent smack of the basil proved a superb complement to the cloying sweetness of the strawberry--a fanciful, yet fabulously fitting foil. The pistachios, meanwhile, provided a countervailing nuttiness, as well as a great crunchy textural ingredient, while the heavy, toasty balsamic marshmallow seemed a bit out of place, though it did add a distinct gravity to the dish. 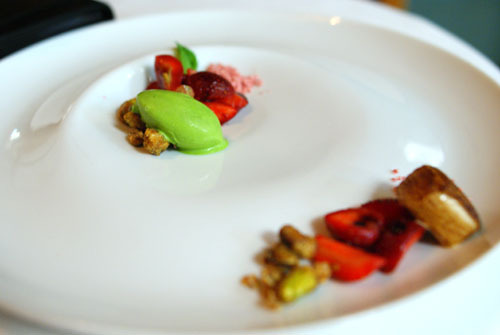 This next dessert was easily the most controversial of the series, due to the miso cheesecake. The cake was actually quite savory, especially when taken in concert with the black sesame; one of my dining companions even likened its flavor to Cheez Whiz! As a result, it was a bit disconcerting to eat, though fortunately it was tempered significantly by the sugary peach (from Masumoto Family Farm in Fresno) and peach sorbet. Given that I'm not a fan of peanut butter, it's not surprising that this dessert wasn't a hit with me. Nevertheless, the ganache did do an admirable job in covering its sapor, while the pretzels contributed a bit of saltiness, while adding a great crunch to things. The best part of this, though, was the ice cream made from Unibroue's Chambly Noire dark ale, with its unique bitterness, smokiness, and toffee notes. FYI: "these pretzels are making me thirsty" is a reference to the Seinfeld episode "The Alternate Side," in which Kramer is slated to utter the line in a Woody Allen movie--yes, I'm a Seinfeld fan. This was actually a dessert that I had on my last visit. 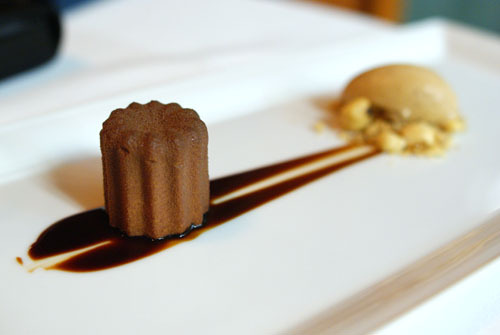 A canelé is a type of pastry from the Bordeaux region of France; however, the "canelé" here was merely a shell, filled with a cold coffee mousse center. The canelé's delectable rum- and vanilla-tinged flavor was thereby moved to the ice cream, with the hazelnuts providing a lovely, nutty finish. 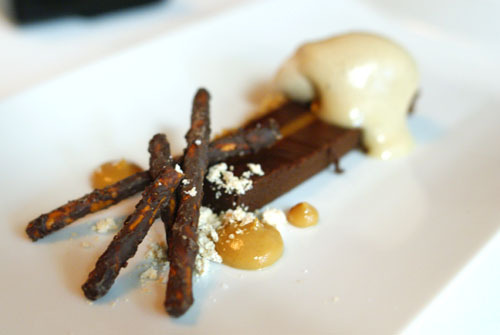 A great interplay of tastes and textures--I can see why this is the restaurant's most popular dessert. And now, Providence's infamous lollipop. Despite being made with mango, we all thought that it tasted of banana, with a spicy savory accent on account of the cardamom. 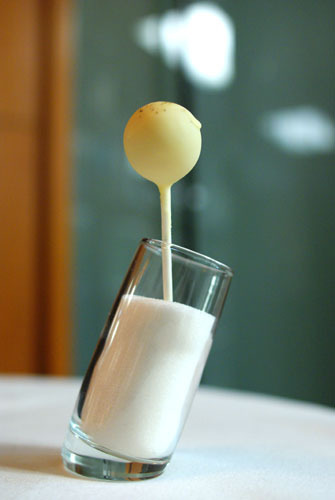 Humorously, we were warned not to shoot the glass of sugar! 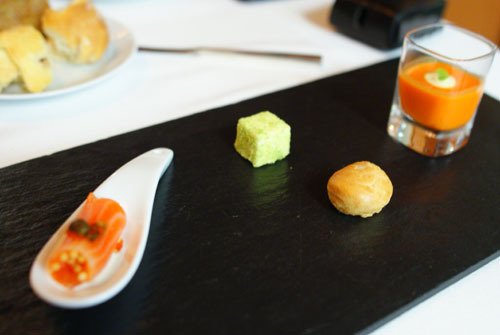 With the menu proper devoured, we were given the requisite plate of mignardises. I first tried the crunchy Almond Praline Truffle, the most conventional of the trio, tasting of Ferrero Rocher with an Amaretto tinge. Next was the Ras el Hanout Gelée, which had an interesting sweet and savory interplay going on, thanks to the use of the Middle Eastern spice blend. Finally we have the Bacon Caramel, which I instantly described as tasting "like breakfast" upon consuming. It was eye-opening, and actually a bit uncomfortable to eat, with a flavor not unlike bacon dressed in maple syrup! Without a doubt, this was my strongest Providence meal to date. While my previous visits were certainly enjoyable, it's only now that I was able to realize the full extent of Michael Cimarusti's talent. What I experienced clearly demonstrated a masterful grasp of ingredients, combined with plenty of innovation, creativity, and a touch of "molecular" technique, all together creating what I consider the most exciting seafooder in the City--it is clear to me now why Michelin chose to bestow two stars here. wow.. almost half the courses were desserts! this looks amazing! What a delightful event this must have been, I am speechless at all these dishes, wow!!!! We went on Saturday and enjoyed many of the same dishes you did! Great post and pictures of my favorite restaurant of all time! 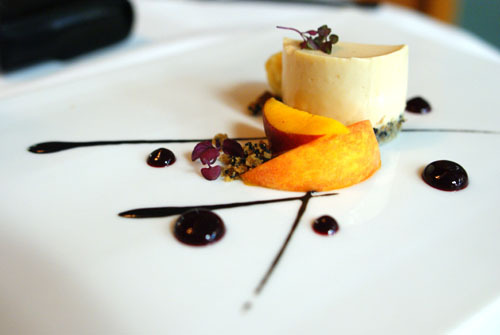 I am very intrigued by the miso cheesecake! this is insanity--we're so jealous! Great job, Kevin! I've been really looking forward to reading this post to see what I missed. Appears that this meal blew away the 5x5, which I found a bit dissapointing. See you at BondSt! $360 is a steep price. but looking at all the luxurious ingredients, it looks like it's money well spent! too bad michelin is leaving LA. 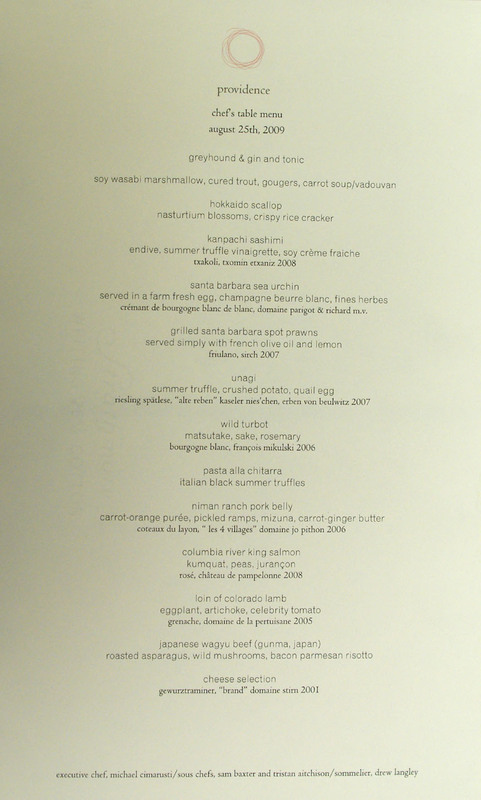 from the pics of this meal, it looks like Providence is a very strong 2-star and working its way up there! 6 and a half hours?! Whoa! That tops Urasawa in terms of time (where I think we stayed for about a little less than 6 hours because they didn't let us sit until 6:30pm). 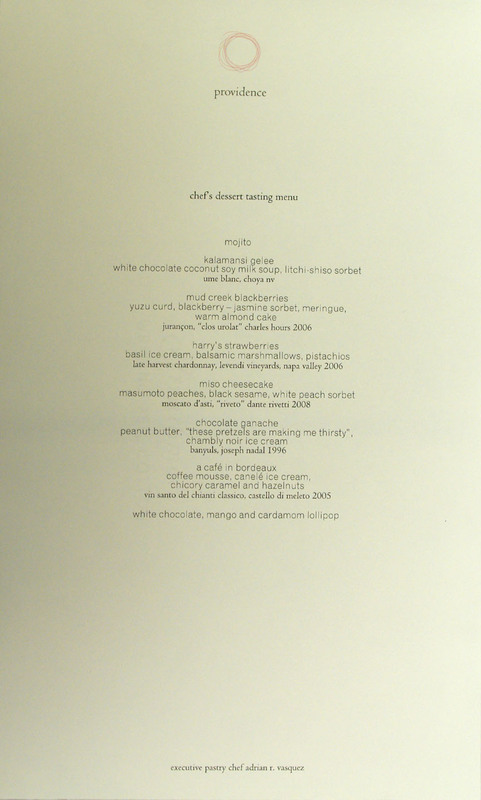 Honestly, I would have a food fatigue around the 20th dish. Looks great though! Did either you or Tangbro1 need more In-N-out or Tommy's? Haha! Thank you Kevineats. You have the best food blog. Joan: Yep! And though Vasquez's desserts are some of the most innovative in the City, I think I still would've liked to have seen more savories. Weezermonkey: Did you go a la carte, tasting, or chef's? Jo: The cheese was a sight to behold, to be sure. Why haven't you been yet??? Nanciful: Yeah that miso cheesecake was "interesting" to say the least. How come I can't find Providence on your blog? Will: Light years ahead of the 5x5. See what you missed out on?!? This all could've been yours. Mike: Yep, it was just a touch longer than Urasawa, though we may try to break the record there again at some point! And no, no Double-Double's were necessary afterward (though I probably could've done one). Eric: I'm glad at least someone does. Brian: Thanks Brian. I'm not sure if it's the best, but it's up there. SicklyBug and Cassaendra: We were, too! just curious.. what are your top 3 favorite champagnes + vintages? That's some meal you have!! Just curious..how much will it be without the discount?? I'm gald that you enjoy the dinner. Will you be going to Wakasan soon, I love to join, assuming that you'll let me and it's with the time frame that I'm still in LA. Weezermonkey: Guess I should've checked your blog first. ;) It's too bad you missed out on the unagi though; it was one of my fav courses. John: Good question. I don't have any favorites per se, though I suppose I do favor those with more pronounced floral and fruit flavors with a subtle backbone of toast and a tinge of minerality. Anonymous: I can't say for sure, but I imagine around $420pp. Dason: I have no idea when Wakasan will be; we have no plans yet. How long will you be around? Danny: Have you paid her yet??? Dason, I think it'd be about $100 less than that amount, since we didn't have full wine pairings. About Wakasan, unfortunately I don't think we'll be able to do anything before next Friday. I believe Caroline may be out of the country; I know Ryan is. My buddy who treated me to Urasawa went to Providence twice last week (he also hit up Cafe Firenze - loved it & Dining Room @ Langham - didn't love it) and says Providence was by far his best LA dining experience. I'll hopefully go there sometime in the next few weeks. Also saw you're hitting up Wakasan... I was there last Monday, hosted a mixer for my incoming Anderson MBA class. Good times! As with all your ultra-long multi-course meals, I just opened up a comment box and typed as I was going through your dishes. 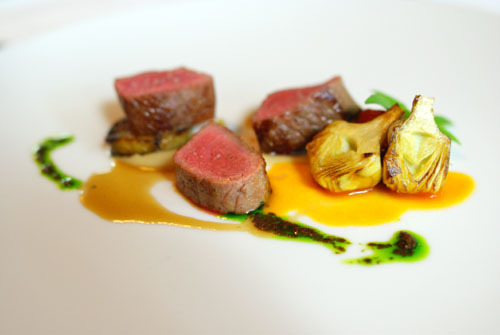 I was surprised that the lamb loin was so gamey. My experience with the lamb there was hardly the case. Odd to pair the steak with risotto. Aaron: Then your comments were pretty sparse for such a long meal! Though the lamb was more robust than expected, I enjoyed it; only Ryan had a problem with it. 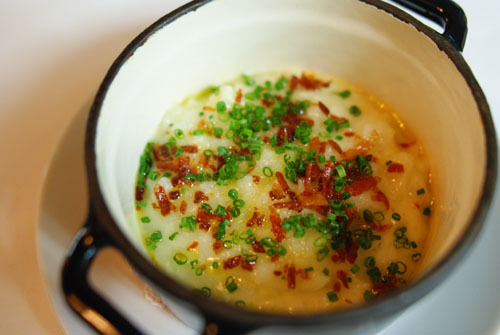 Agree about the risotto though. LOL, ya, $200 damage for me. Ouch! $200, I paid her $190! Also, I just found out that we were overcharged slightly, so I owe you $10. I'm so jealous! 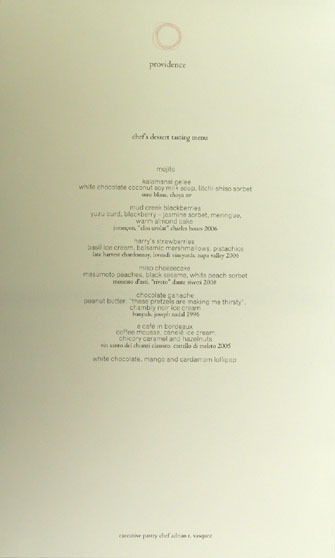 I wish I could've done the 22 course special! How do the places in DC compare? And what are you doing on the Anderson google group?? I thought you went to Marshall! I was PT. Who do you know? Romita Jerath, Stacy Ho, Taleen, Chris Cheung, Raman Gulati, et al. I went to your end of year parties @ Les Deux & Edison too, so I met a bunch more ppl there. Just look me up on Facebook and see which friends we have in common, I'm sure there are a few Berkeley kids we both knew. BTW, if you ever make it back up to Berkeley soon, go to Sushi Sho on Solano Ave. and order the omakase. He only seats 8 ppl at a time & no reservations so there's a wait... he'll be retiring very very soon unfortunately. Even after Urasawa & Zo, he has my favorite sushi. I know the first three people, and know of the other two. Where do you know them from? As for Sushi Sho, it's already closed, though I heard Aki-san might be opening up in a new place. It's a pity that I didn't get to go while I was attending Cal. I've known Romita for 22 years, really really close family friends... I know the other two girls through her. Raman & I went to Cal & Cheung and I went to Jr. High & HS together. Sadly, I'm not attending the Cal game, but I do need to get back up there for the restaurants. 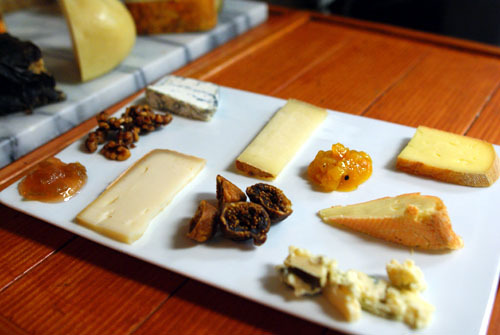 I really want to do Chez Panisse properly, downstars. We at USC know better than to schedule classes on Saturday! Unfortunately, I think it'll be a while before I return to Providence. With the epic meal detailed here, I feel that I've experienced the entire breadth of what the restaurant has to offer. Anywhere else pique your interest? Wow, looks amazing.. especially the desserts!!! 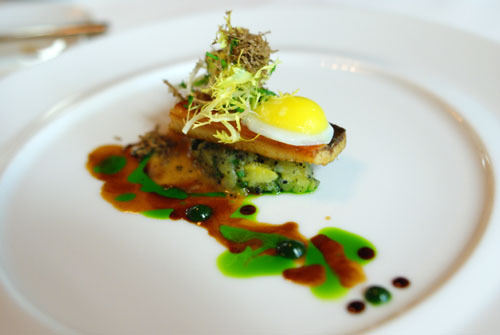 Providence actually has some amazing off-menu tasting dinners for repeat visitors. Chef Cimarusti actually encourages customers to come back regularly, as he improvises full tasting menus completely distinct from that offered on the menu. That's great to know for next time. 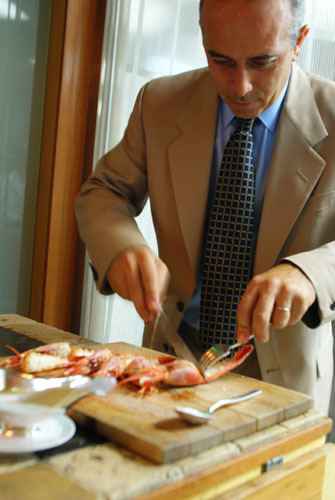 Are the spontaneous tastings only on offer when Chef Cimarusti himself is in the kitchen? Yes, although fortunately he's there almost every night. 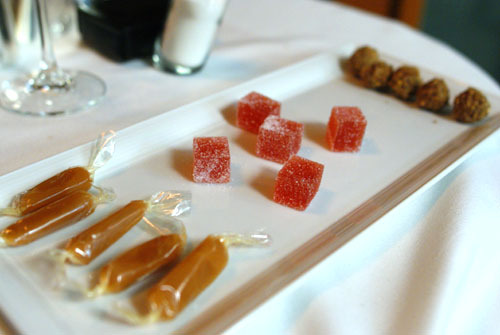 In my opinion there's no better way of experiencing a chef's imagination than to have an improvised tasting. While the dishes may not be as refined as the items you find on the standard menu, you do get a deeper glimpse into the imagination and experimentation of what we may see to come in the restaurant. Aromas, I'm using a Sony a300 DSLR currently. The lens is a Sigma 28mm f1.8 macro. I almost never use flash; it's disrespectful to other diners and makes the food look artificial. One last question: Yes,flash is indeed disrespectful to dinners. I have no other choice for now since my humble Canon powershot A630 photos under dim lit conditions, without flash, would be useless. But, tell me: what do you specifically do (what setting, setup, technique) to get your Sony a300 DSLR Sigma 28mm f1.8 macro lens to take those sharp clear detailed pics in dim light conditions (most restaurants you went to had surely dim lit lightning). Many thanks for your generous advices. The first thing I do is manually set white balance. This is important since restaurant lighting is almost always far too warm, and if you don't properly handle the white balance, photos will come out with an orangish hue. I then meter the scene at the dining table, and set a manual exposure for roughly +2/3 EV over what the camera's built in meter tells me. If you let the camera decide the exposure, it will tend to underexpose, since the camera's meter will be fooled by the large white areas of the plate, thinking that the scene is bright. In a reasonably dim restaurant, my exposures are generally in the 1/10s, f2.0 range, at ISO800. Since the Sony has in-body stabilization, hand movement isn't usually a huge issue at shutter speeds faster than about 1/6s.